I admit that this is basically a re-posting - recipe was already featured on Nami-Nami back in 2007 - but it's been a while and I've tweaked the recipe during those years. Hope you'll forgive me :) I liked the original version quite a bit, but think this modified one is even better. Curiously, I've halved the amount of coconut. If you let it cool completely before tucking in - preferably overnight - it's still immensely coconut-flavoured, yet delicately letting the rhubarb shine as well. Double the coconut - and it's all too sweet and just not right.. 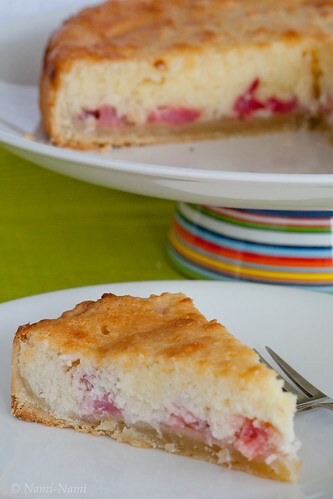 So here you go, Rhubarb and Coconut Tart, version 2012. Start with the crust. Sift flour, sugar and salt into a bowl. Add the butter and pinch until crumbly. Add the egg, combine the pastry quickly. Wrap into a clingfilm and place into the fridge for 30 minutes to rest. Butter a 24 cm loose-bottomed cake tin. Roll out the pastry on a lightly floured surface, making the circle about 34 cm in diametre, then line the bottom and the sides of the cake tin with the rolled-out pastry. Blind bake at 200 C/400 F for 10-15 minutes until lightly golden. Meanwhile, cream the butter, sugar and vanilla until combined. Add the yoghurt/sour cream, eggs, and coconut. Cut the rhubarb into chunks. Take the pre-baked tart shell out of the oven, spread rhubarb on top. Spoon the coconut topping over the rhubarb, smoothing out the top. Return to the oven for about 30-35 minutes, until the tart is lovely golden brown. Cool (a little or completely) and cut into slices to serve. This is a great recipe. I love rhubarb and coconut! Yes, this is already posted. But recipe is really very good. Thank you for sharing this recipe. I found your site on foodblogs.com and thought I'd stop by and check it out. Just subscribed to your feed and can't wait to see what your next post will be! www.cookalot.co.uk staff want to thank you for sharing this fab recipe.